Are you concerned about the financial impact of not complying with Meaningful Use? You’re not alone. In order to do so, you must first be able to communicate using common terminologies. Achieving Meaningful Use with certified electronic health record (EHR) technology remains a top priority for healthcare organizations that want to qualify for federal incentive payments and avoid penalties for noncompliance. Learn about current terminologies used to capture problem lists and diagnoses. 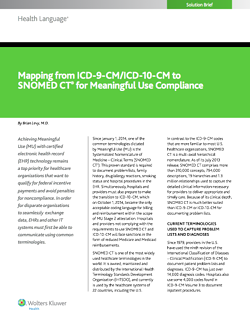 Discover the advantages of leveraging SNOMED CT for Meaningful Use Compliance. Find out how advanced mapping solutions can simplify your process. Discover SNOMED CT’s impact on Meaningful Use and healthcare delivery. To dowload the white paper, please fill out the form to the right.